Sirhan Sirhan, the assassin of Robert F. Kennedy, is one of the best-known killers in American history. Yet two major television networks recently broadcast segments about the Kennedy assassination without mentioning his name at all. What gives? On June 5, 1968, Sirhan, a Palestinian Arab with Jordanian citizenship, shot the senator four times at point-blank range in a Los Angeles hotel. There has never been any dispute regarding Sirhan's motive. In multiple interviews afterwards, he said he did it because Kennedy was pro-Israel. The recent 50th anniversary of the assassination sparked much discussion about it in the news media. Around the same time, CNN broadcast a major four-part series called "1968: The Year That Changed America." A large portion of it was devoted to that year's presidential race, including Kennedy's campaign for the Democratic nomination. There was a segment of several minutes about the assassination. Incredibly, the CNN narrator never mentioned Sirhan Sirhan's name or the reason that Kennedy was murdered. The segment portrayed the killing as if it was just part of the general turmoil in America that year, which included Vietnam War protests, racial tensions and the assassination of the Rev. Martin Luther King Jr. Dr. King's murderer, James Earl Ray, was mentioned by name. On July 4, the popular MSNBC program "Morning Joe" featured a special five-minute segment, narrated by veteran anchor Tom Brokaw, about the Kennedy assassination (hooked to the 50th anniversary). Once again, amazingly, there was no mention of Sirhan or the reason that he murdered RFK. And there's nothing that makes the Palestinian cause look as bad as the fact that a Palestinian Arab murdered one of the most popular political figures in modern American history. And that means that U.S. involvement in Vietnam would have ended much sooner. Nixon never would have been president, and Spiro Agnew never would have been vice president. There would have been no Watergate. Race relations likely would have followed a very different trajectory. All of that went up in the smoke of a Palestinian's gun. Not only that, but it means asking some uncomfortable questions about why Sirhan is regarded a hero among the Palestinians. During his trial, The Los Angeles Times reported that the PLO distributed posters throughout Beirut with a photo of Sirhan, a drawing of a Palestinian with a rifle and the headline: "Sirhan Bishara Sirhan: a Commando, Not an Assassin." Yes, that's the same PLO that the United Nations, the news media and the State Department keep telling us is moderate and reasonable, and gave up terrorism. If so, why does the PLO consider terrorists like Sirhan to be heroes? And why have so many sympathetic articles about Sirhan appeared in the Palestinian press? Those are not the kinds of questions that CNN or "Morning Joe" want to talk about. 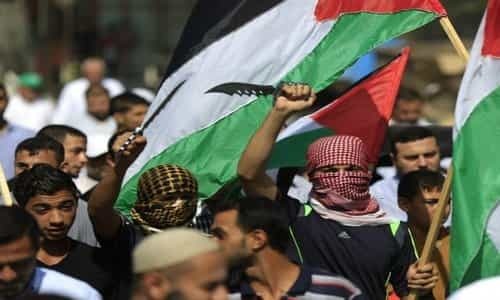 Successive U.S. administrations have refused to demand that the Palestinian Authority hand over the killers for prosecution, and major news media outlets have consistently refused to treat it as a serious issue or even ask Palestinian spokesmen about it. That's because keeping Sirhan Sirhan and other Palestinian killers of Americans out of the spotlight is also a way to keep promoting the Palestinian cause.